UCLA wide receiver Darren Andrews and tight end Caleb Wilson were added to the Biletnikoff Award Watch List on Tuesday. The award recognizes the top receiver in college football at any position. Andrews is tied for the national lead in receiving touchdowns with seven and his three touchdown catches against Hawai’i were the most for a UCLA player in a single game in 112 years. His 114.25 receiving yards per game lead the Bruins. Andrews and Wilson are tied for ninth in the country in receptions per game with eight. 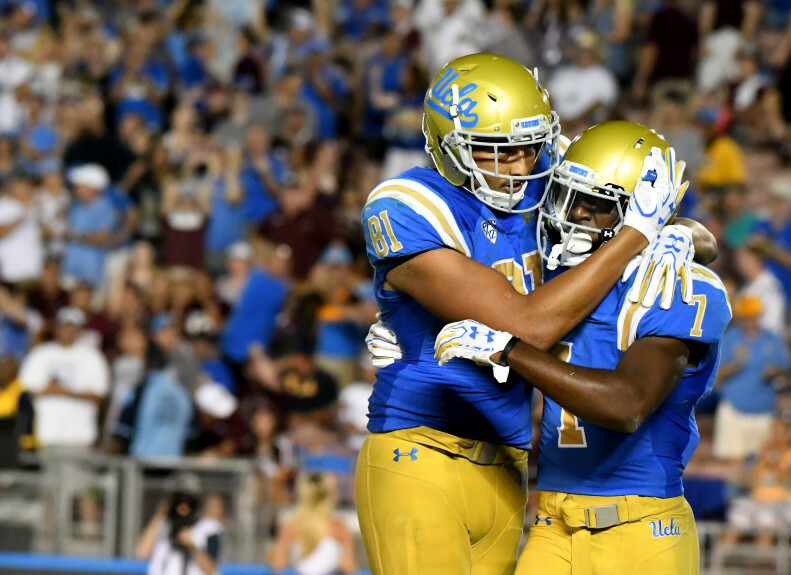 Wilson set the single-game UCLA record for receptions with 15 against Texas A&M. His 208 receiving yards were the most for a UCLA tight end and it was only the third time that a Bruin eclipsed the 200-yard mark. The former USC walk-on is averaging 106 receiving yards per game. This entry was posted in Football and tagged Caleb Wilson, Darren Andrews by Thuc Nhi Nguyen. Bookmark the permalink. FBI sting at SC for NCAA fraud? Isn’t that just a typical day over there? The FBI just reopened the Sam Gilbert case. Abortions, cars, cash. Just wait it isn’t over in Weswood…. The same guy that was already indicted back in the 80s and is now dead. Haha good luck with that. I wonder if that coach ever partied at the SoCal Med Center with their Dean? SC basketball is the program in hot water for–once again–cheating. Looks like you’ve brought a knife to a gun fight. And nice game last night in The Palouse. SC football exposed as well.